Acne or pimples are one of the comments skin disease which causes a lot of embarrassment to patients. It not only affects the cosmetic appearance of the patient but also affects the self confidence. Acne occur anywhere above waistline. Boys and Girls are very conscious about their looks and dont want even a single acne or acne scar on their face but these lesions do spoil thier mood every now and then. Sebum is produced by the body and when it gets clogged in pores and gets infected it forms a pimple r an acne. Acne has been linked to diet and many other myths but till date no proof has been found to conclude that certain foodstuffs like milk, chocolates, mangoes or pickles cause any harm to skin in causing acne. People who hit gym and take body body supplements are more prone to get acne on back because most of these supplements contain steroids. A daily regimen of washing face 2-3 times a day with a good face wash containing salicylic acid and benzoyl peroxide is a first step in controlling excess oil production and preventing acne. One must avoid applying oily creams and hair oils on scalp as these things cause blocking of the pores and give rise to acne on face and scalp. Make up is also something that no girl can give up. One should look for ” non comdeogenic” mark on the make up products to make sure that they dont cause any acne. 2. Oral Antibiotics, Isotretinoin, Zinc etc. 3. Peels like salicylic acid and mandelic acid, black peels. 4. Lasers like IPL to control sebum secretion and treating infection in glands. 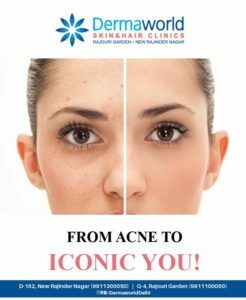 This entry was posted in Uncategorized and tagged Acne treatment in delhi, best acne specialist in delhi, Best Acne Treatment in Delhi, Best doctor for acne in delhi, Best skin specialist in elhi for acne. Bookmark the permalink. ← Say No to popping pimples! Get your acne treated at Dermaworld Skin & Hair Clinics.